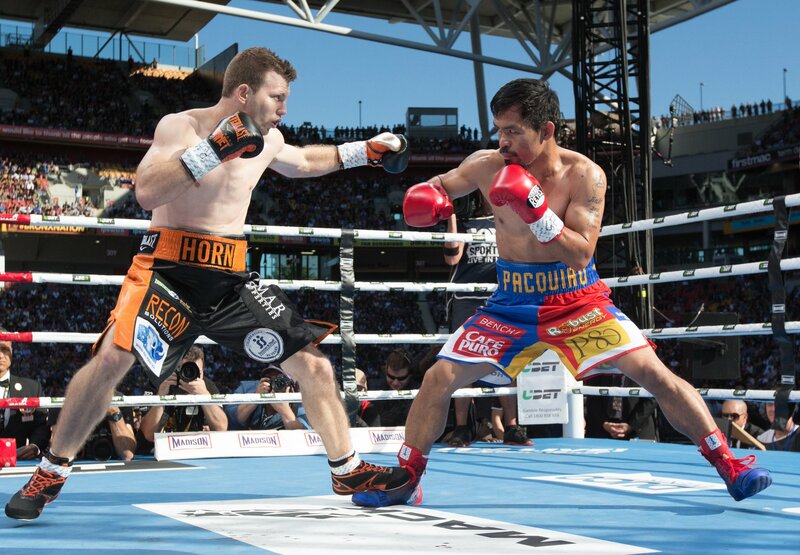 In one of the more shocking decisions in years, unheralded Jeff Horn scored a controversial unanimous decision win over Manny Pacquiao to win the WBO welterweight title in Brisbane, Australia. Almost no one gave Horn (17-0-1, 11 KOs) a chance to even compete with Pacquiao (59-7-2, 38 KOs), who was looking for his 60th win, but to Horn’s credit, he came out aggressively at the start of the fight and never let up. Horn used his size advantage to try and bully Pacquiao around, but Manny began to figure out his style and seemingly took control of the next couple of rounds. In the sixth round, a clash of heads opened up a cut on the right side of Pacquiao’s hairline and Horn then stunned Pacquiao with about 30 seconds left in the round. As the fight continued, the two engaged in a brawl, but it was Pacquiao who was connecting a higher percentage of his punches (182 total punches for Pacquiao, 92 for Horn), but was again halted by another headbutt that opened up a cut on the left side of Pacquiao’s head. However in the ninth, Pacquiao put a sustained beating on Horn, who was a bloody mess and seemed to be ready to go. Though Horn survived the round, the referee warned Horn that he was going to give him one more round to show him something or he would be stopping the fight. The 10th round saw Pacquiao look a bit fatigued as he let Horn off the hook but stepped up the pace again in the 11th and 12th rounds. Though it appeared Pacquiao did enough to win a close decision, the judges actually awarded Horn the fight with scores of 117-111, 115-113 and 115-113. 3MoreRounds scored the fight 115-113 for Pacquiao.